My responsibility was to raise administrative awareness of requests, issues, and interest from faculty and students who are digital scholars. I also conveyed digital resources and support opportunities to students and faculty while conducting workshops in digital tools and methods. I have been an outspoken advocate at the Graduate Center for students who need digital work to be evaluated as an integral aspect of dissertation research, facilitating conversations between graduate students, PhD programs, librarians, and lab administrators. I facilitated a discussion about digital dissertations among lab coordinators, students, professors, librarians in December 2013 in the New Media Lab. This was a springboard for further discussions such as the panel and discussion on “Evaluating, Valuing, and Promoting Digital Scholarship” I coordinated in 2015. I also worked as editor and content curator of a Digital Dissertations resource hub on the GC Digital Fellows website that launched in Fall 2014. 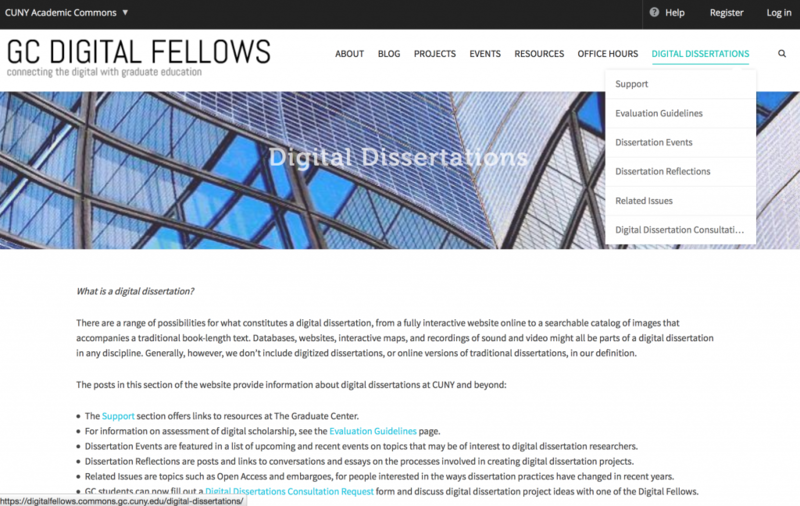 The GC Digital Fellows Digital Dissertations Resource: an information hub for students who are interested in creating a digital dissertation (and the committee members and academic departments who support them). It includes sections for defining digital dissertations, evaluating them, and reflecting about the process of producing digital scholarship as part of the dissertation experience.